Baby Chickens at Haddock Inn! There is a good chance that this is the only photo of Evelyn Forrest standing in the lower level of Haddock Inn. Shortly after the Forrests arrived at Toccoa Falls, Evelyn and Richard realized the need to plant gardens and begin raising livestock. She had students and faculty members to feed along with the numerous guests at the inn. Chickens, even then, were easy to care for. 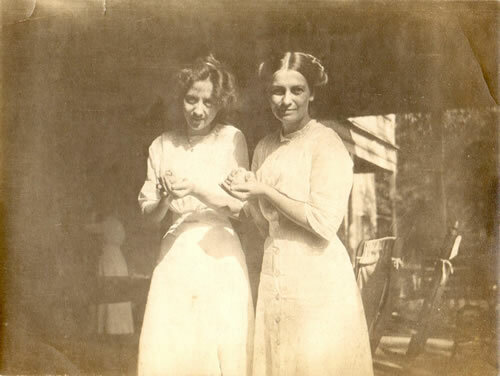 In this photo, Evelyn Forrest (on the right) is holding a baby chicken and the young lady with her is one of the Institute’s first students.